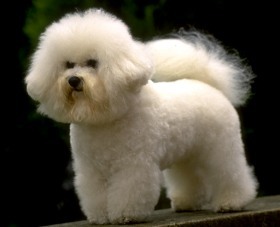 I was originally known as the Bichon Teneriffe when my ancestors came from the Canary Islands in the 14th century. My early relatives were household pets of the rich and famous until fashions in lap dogs changed. Then we had to alter our tastes and start living with the common folk. In the mid 1930�s, our name was changed to Bichon Frise and we were admitted to the French Kennel Club. That was our New Beginning and it has been smooth sailing ever since. I can play the role of the perfect pampered pooch with vigor, vitality and real style. When fully grown, I am between 10 and 12 inches tall (25.4 to 30.5 centimeters) and I weigh between 7 and 12 pounds (3.2 to 5.4 kilograms). We have no Bichon Frise Breeders listed at this time. Click here to place your Bichon Frise Ad!